Using an hour meter is pretty easy. 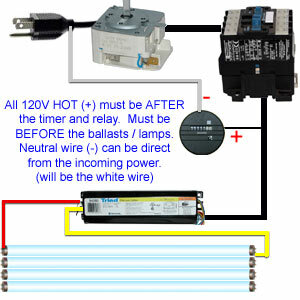 Just connect the (-) pole directly to a neutral wire, and the (+) pole to any wire that is HOT only when the unit is on. This could be where the ballasts receive power or similar. As long as the unit has power, it counts up. The white section is parts of an hour, the black section is whole hours. When it reaches the limit, 99999 hours, it just rolls over. Go to the page to buy this hour meter.